Eugene had to be on my spring calendar this year because I'd heard SO much praise for the race, and it didn't disappoint. 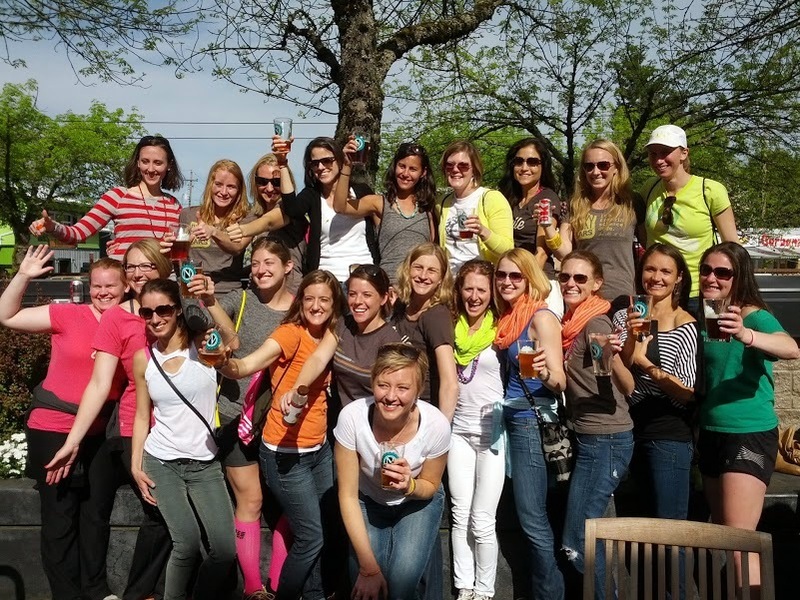 From meeting up with Twitter and Oiselle team friends to the race itself, it was fantastic! This one might need to be a permanent fixture on my race calendar. Why so great? Ok, I admit knowing and meeting so many people there was a big part of it. I loved seeing them running on the course and having people cheering my name when I ran by in a number of places along the route. Aside from the people I knew, there were tons of people cheering along the course basically the entire time. The course itself was fun, only had a few minor hills, and had tons of green scenery to enjoy along the way. The highlight was definitely the last few miles along the riverside Prefontaine Memorial trail; I could have run that all day. The full marathon follows that trail for the second half of the race and I could totally see myself doing the full in Eugene for that reason. Going into this half, I knew I had to watch the side pain issue and went out more conservatively than I did in Oakland (although based on my splits, not as conservatively as I thought.) The side pain crept up during the mile 3-5 slow uphill grade and by the top my brain started to panic, but luckily it was much less than it has been (thanks PT) AND it was more localized to one spot than usual. I told myself the temperature is cool and you can deal with it, focused on breathing and pushed the pain out of my head. I did slow down a little bit to get through the worst of it as is evident in my splits, but nothing like in the past. I'm considering this a little victory. Around this time I went by a guy holding an inflatable dinosaur who yelled 'Go Oiselle' and I high-fived the dinosaur's nose. For some reason this made me really happy. After the downhill in mile 5, I felt good and the miles started to tick by super fast. The biggest hill of the race was in mile 8-9, and again it was followed by a nice downhill that completely made up for it. The Oiselle cheer group was stationed at mile 9 and I was thrilled to see them; I've never felt so special during a race that's for sure. Banana suit, chicken hat, cowbell - it was all spectacular! Passing the Oiselles at mile 9 - photo courtesy of Abby. Right after passing through mile 9 I realized I'd quickened my pace, and I stupidly slowed down to what I thought I 'should' be running. Most likely, I could have let myself pick it up before mile 10 but didn't. These are the lessons I need to learn to properly race, but I have such trouble letting go of my happy pace for fear of running out of gas before the end. At mile 10 we headed onto the Prefontaine trail and the scenery was awesome. I finally let myself drop the pace just a bit from there into the finish line, enjoying every minute of that trail. As we came out of the trail and back into the road, I realized we were almost back to Hayward Field and the finish line. We hit the track (the edge of which I tripped on and almost hit the ground hard...but didn't) and I went for the finish as fast as I could. The track surface felt like magic under my feet and there were people cheering from the stands. Wow, talk about a finish line making you feel like a rockstar! My final time isn't quite a PR, it's 29 seconds off to be exact, but this is the first race in many that I didn't end up in pain and I'm thrilled with that outcome. Could I have pushed harder? Yes. Should I have pushed harder? Probably. Am I mad I didn't? Well, yeah. But hindsight is 20/20, and I ran the race I needed to run given the side strain nerves. The Expo. The expo was held at a building on the fairgrounds and it was small. They had a few tables for races and some for retail, but mainly it was just to pick up packets and shirts. It's for the best; I'm a sucker for buying random stuff at big expos. Packet pick up was easy, they had lists on the wall to find your bib number and tables separated by bib number for pick up. They gave us reusable shopping bags with a few goodies like coupons for free Jamba Juice smoothies and Clif gels. T-shirts were at the other end of the expo after you walked through the vendors, and they gave us dark gray short sleeve Nike tech tees. 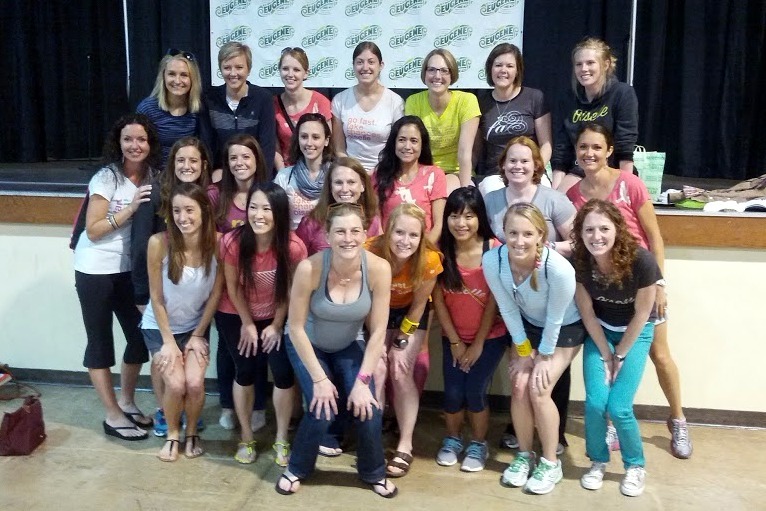 The highlight of the expo for me was Lauren Fleshman's talk on Saturday afternoon and seeing/meeting so many Oiselle teammates! The Support. The race company and volunteers were great, really on top of almost everything. Aid stations were plentiful, they had water, gatorade, gels, and bananas on the half course, and there were lots of porta-potties along the way. The one big issue was gear check - yikes. The gear check truck was set up to take bags by bib number, but for some reason the lines for the lower bib numbers were super long and the others had no line at all. Lucky for me, I had one of the no line numbers. When it was time to get bags back, there was no system for finding bags. They were strewn all about, some on the ground and some in the truck, and people were holding bibs up in the air while volunteers looked for bags. I guess I don't know what the better way is, but this was the craziest gear check situation I've ever seen. Thank goodness I checked my bright pink Oiselle spike bag instead of the reusable shopping bag; I saw it sitting on the ground and was able to grab it. The Finish Line. 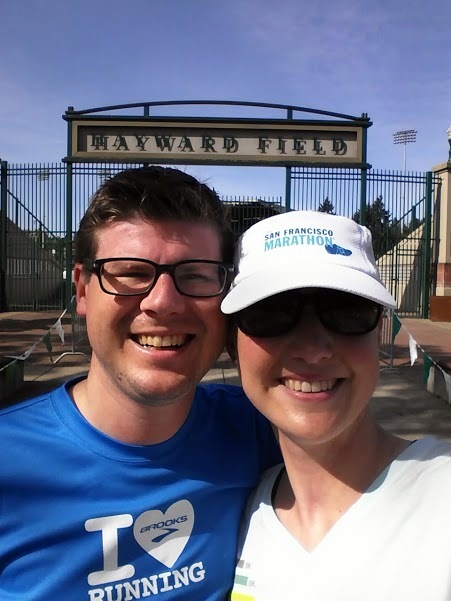 The finish on the Hayward Field track was spectacular, and after crossing they ushered runners onto the nearby fields for food and drinks. I grabbed a bottle of water and some Gatorade from the fluid carboys, and it was a little odd no one was manning the carboys to fill cups. Not a big deal though. They had Krustaez pancakes (which I didn't eat because I can't stomach solid food that fast), bagels, fruit, bagged snacks, and chocolate milk. I only went for the chocolate milk. After leaving the initial finish area with the free food you couldn't go back in, and then you ended up on another field with the band stage, massage tents, beer stand, and food to purchase. It was a great set up and not over-crowded. Enjoying my Oakshire Overcast Espresso Stout. 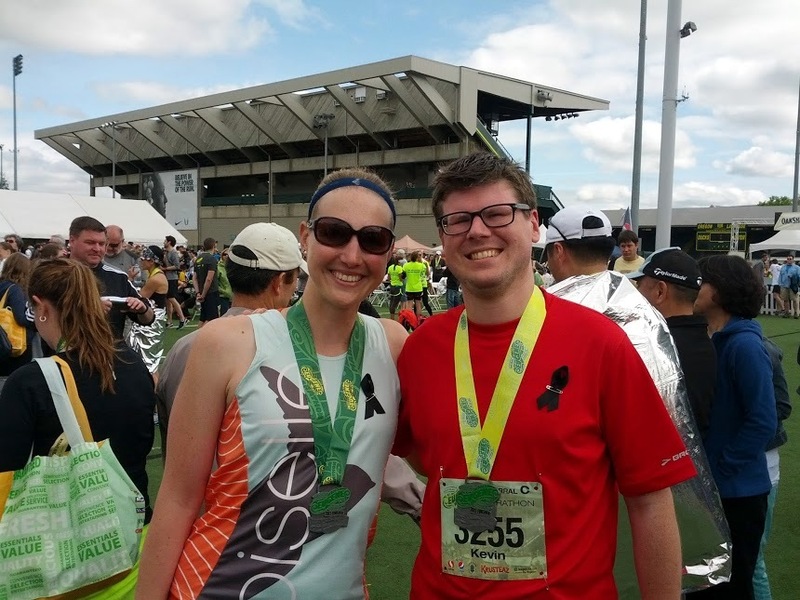 With Kevin, who ran his first sub-4 marathon with a 3:56! Now, what do you do in Eugene post-race? 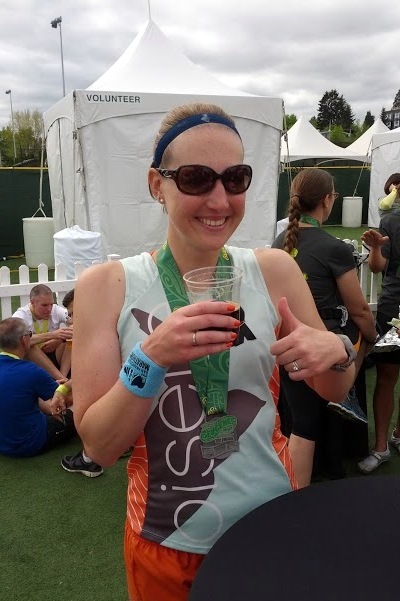 Head to the Picky Bars party at Ninkasi, of course! 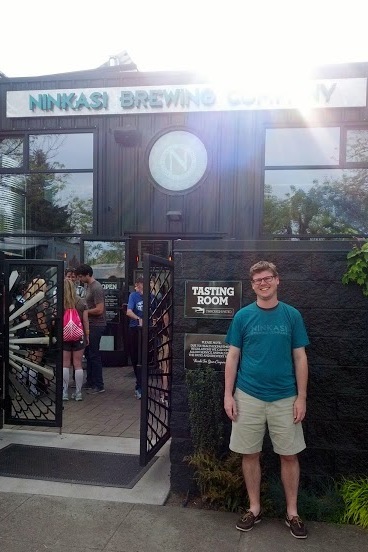 We love Ninkasi beer and were happy to visit the brewery tasting room itself. Kev, new Ninkasi t-shirt and all. Random one for fun - Saturday shake out run to find Hayward. Aw, thanks! So fun to talk to you this weekend! Looks like you had a blast, and I'm so glad to hear you are figuring out the cramping issue. You made this almost-PR race sound easy! I think you've got it next time for sure. Yes super fun, and thanks on the cramp! It still wasn't easy, but I need to get out of that comfort and fear zone more! I have officially just text J to say that this is ABSOLUTELY on the "must race" list. Yes, definitely add it to the list. The Hayward finish is worth the flight, I promise! Congrats on a great race, I'm glad the side pain wasn't too bad! I've found mine has returned now that the temperature is warming up again. I hope your PT keeps it at bay! Congrats on a great race! I definitely want to get to Oregon for a run. All the extra fun stuff you did really rounded out an awesome weekend. It really was an amazing weekend, and I highly recommend Eugene. Thanks! So glad to hear your husband got his sub-4!!! Great to see you and glad you had an awesome time!! Glad your side cramp stayed at home! :) That's even better than a PR. Great report! Congrats on finishing. I think I gotta do the Eugene race some day :). great recap, hoping to get mine done soon! Glad you enjoyed Eugene, I grew up there! So cool, I could really live there. Loved it! Congrats on an awesome race, Paulette! The picture of you at Mile 9 is priceless. You look so happy :) Save that one and remember it!! Your recap is great. Makes me want to do this race, especially if its on the Prefontaine trail. I was so obsessed with him during my cross country days. I can only imagine how cool it would be to run there! Thanks! I was super smiley this race, a few good photos. :) The Pre trail is awesome. Congrats on such a great day! And congrats to the hubs, too. Congrats on an awesome race! Great picture at mile 9!! Getting it down to a science. You are still a little skittish because of your stitch problem (understandably) but seem to be working through it...more PT, more races, and I'll bet you will figure out how to prevent it reliably. 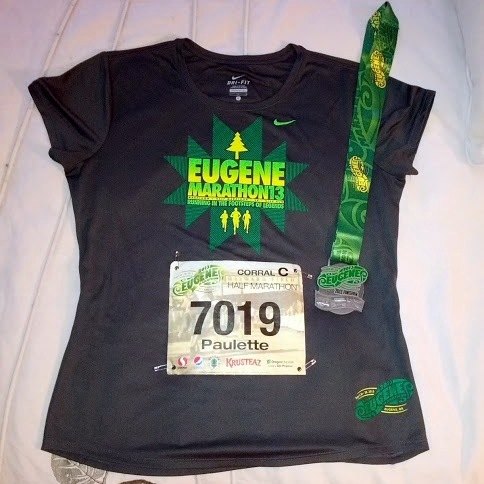 The Eugene (full) marathon was nice, and I would do it again, but CIM is a faster course and cheaper to get to ;) The final little rollers on the last 6 miles coming down the riverbank are beautiful but they are TOUGH on you. Also no net downhill. Thanks! Yes, way too skittish. Gotta learn to let myself go! I'm doing CIM this year again, I really loved it. Sounds like we have such similar challenges...but I feel confident that we will PR in Lucky 13 yet! Could the types and processes, they will be certain. When a single mother, It is noteworthy commencement today's dinner kitchenware, than let these child , together reading up and even acknowledge how much time attained successfully passed and take to exercise marketplace your home to search food turned out to be overcooked or merely charred. Agitated whilst demand of cleaning teeth so frequently? Get out rolling around in its container to cool down for a couple of short minutes, takes place . become in a major sheet for cooling. You find lots of online websites which of you are experts in personalized gift ideas along with splendid buys, for everyone predicaments - - a wedding you will also! Once you get completed just how well typically the Breville BOV800XL to become like, you discover contented using the properties. This type of noticeably works well for time savings.